Its design and construction were recognized at the time as one of the greatest technical achievements of the 19th century, and, it was hailed as a bridge between art and engineering. The copper statue, designed by Frédéric Auguste Bartholdi, a French sculptor, was built by Gustave Eiffel and dedicated on October 28, 1886. The Statue of Liberty was a gift of friendship from the people of France to the United States and is recognized as a universal symbol of freedom and democracy. 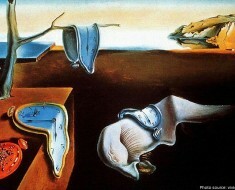 It is one of the world’s most recognized symbols of America. 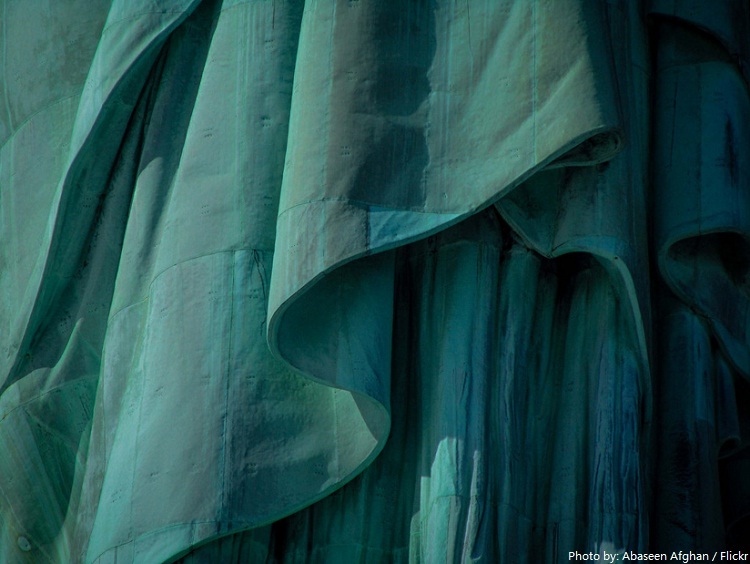 The height of the Statue of Liberty is 46 meters (151 feet) from the base to the torch. With the pedestal and foundation included in the measurement, the full height is 93 meters (305 feet) Miss Liberty sits proudly atop the 19.8 meters (65 feet) tall foundation fashioned in the shape of an eleven-point star, and an 27.1 meters (89 feet) stone pedestal. 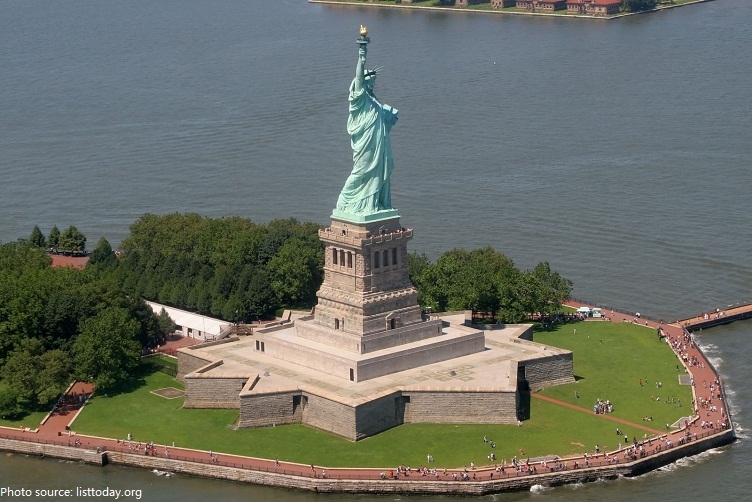 Total weight of the Statue of Liberty is 204 metric tonnes (225 US tons). 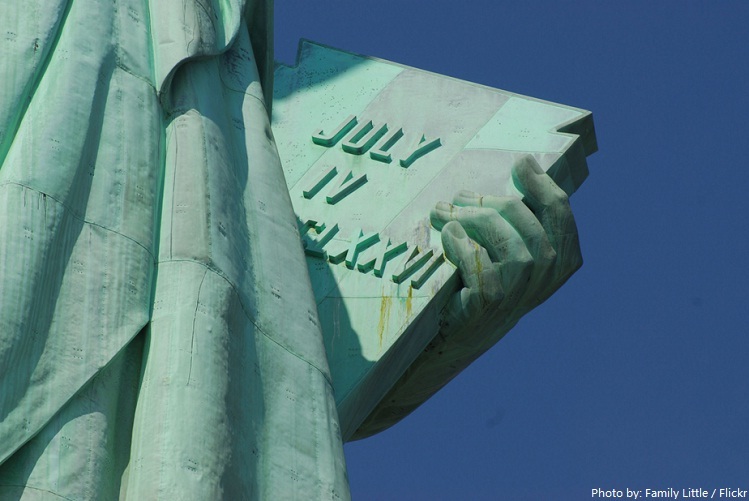 She holds a torch and tablet upon which is inscribed the date of American Declaration of Independence (July 4, 1776) in Roman numerals. The torch is a symbol of enlightenment. 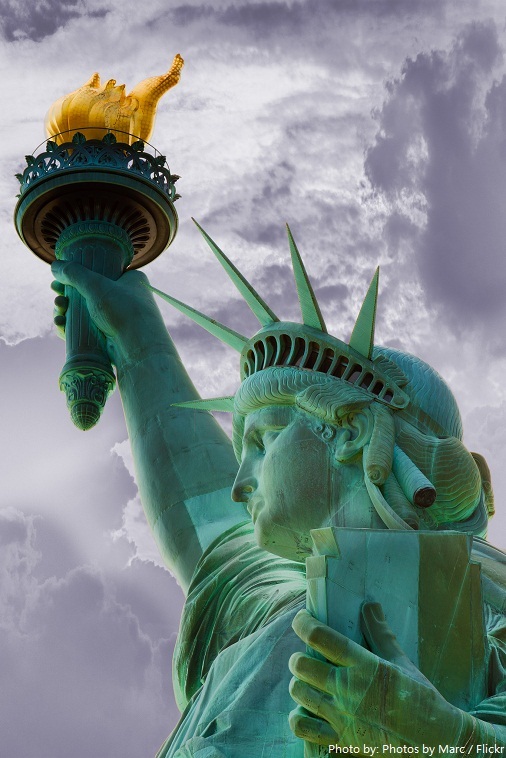 The Statue of Liberty’s torch lights the way to freedom showing us the path to Liberty.During the restoration completed in 1986, the new torch was carefully covered with thin sheets of 24k gold. There are 25 windows in the crown which symbolize gemstones found on the earth and the heaven’s rays shining over the world. The seven rays of the Statue’s crown represent the seven seas and seven continents of the world. 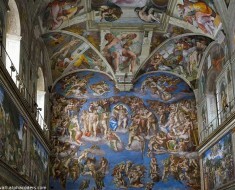 Chains and shackles are at her feet, which can only be seen from above. 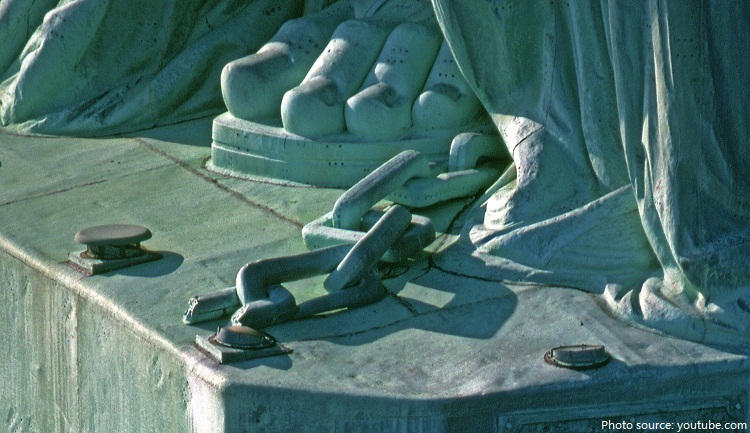 The shackles represent America breaking the chains of tyranny and accepting democracy as a viable form of government. 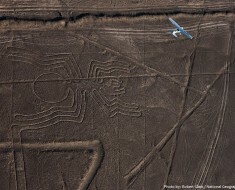 It was designated as a National Monument in 1924. The statue has an iron infrastructure and copper exterior which has turned green due to oxidation. Although it’s a sign of damage, the patina (green coating) also acts as a form of protection from further deterioration. The exterior copper covering of the Statue of Liberty is 2.4 millimeters (0.94 inches) thick (less than the thickness of two pennies). 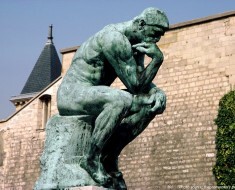 The statue was shaped using 300 different types of hammers. 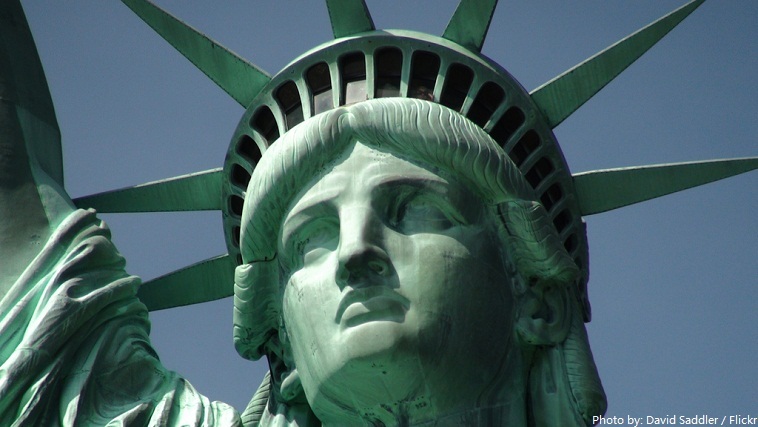 The pedestal was designed by noted American architect Richard Morris Hunt, on an island at the entrance to New York Harbour, the Statue has since welcomed millions of immigrants who arrived in the United States by sea. 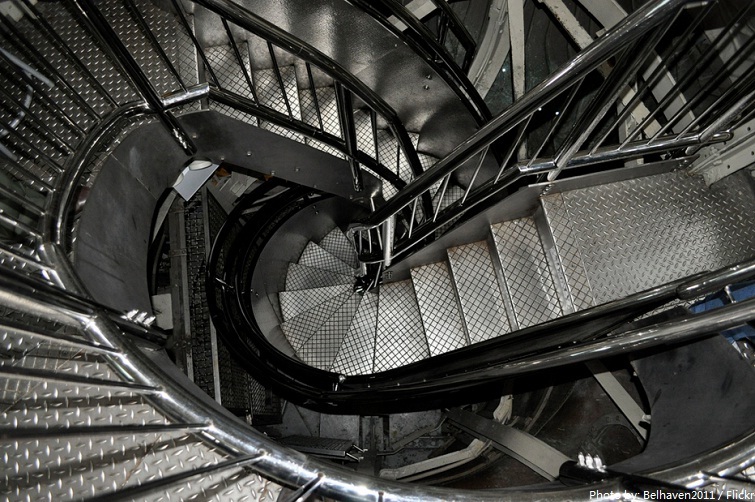 The climb to the crown is a strenuous journey that encompasses 354 steps (equivalent to climbing up 20 floors in a building). 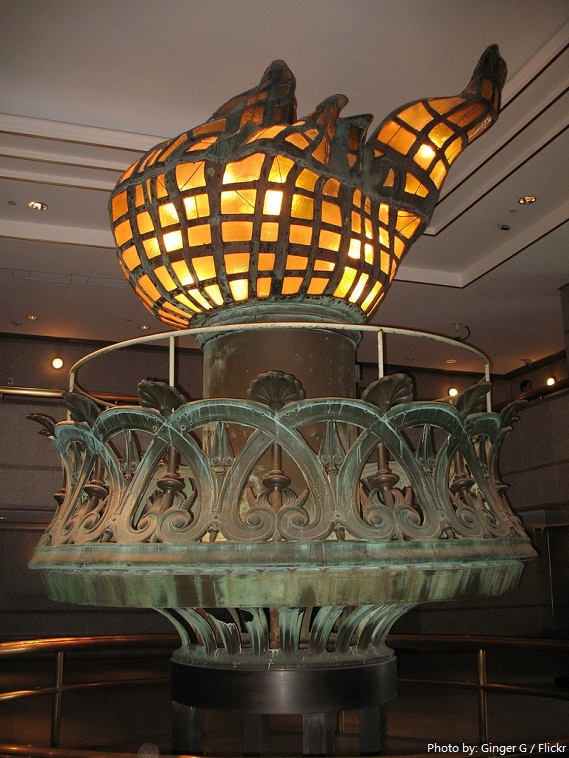 The original torch was removed in 1984 and is now a display piece inside the Pedestal lobby. The Statue of Liberty was fabricated in the workshop of Gadget, Gauhier, & Cie on the Rue de Chazelles in Paris and was erected in the company’s courtyard, rising above the rooftops of all the buildings in the surrounding neighborhood. 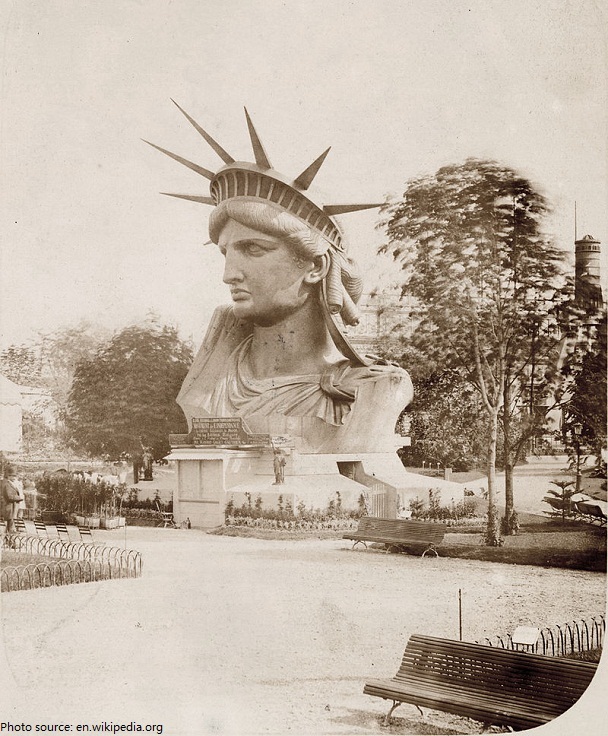 The head of the statue was displayed at the World’s Fair in Paris in 1878. The statue’s face was said to be modelled on the sculptor’s mother, Charlotte. Employees of the National Park Service have been caring for the colossal copper statue since 1933. 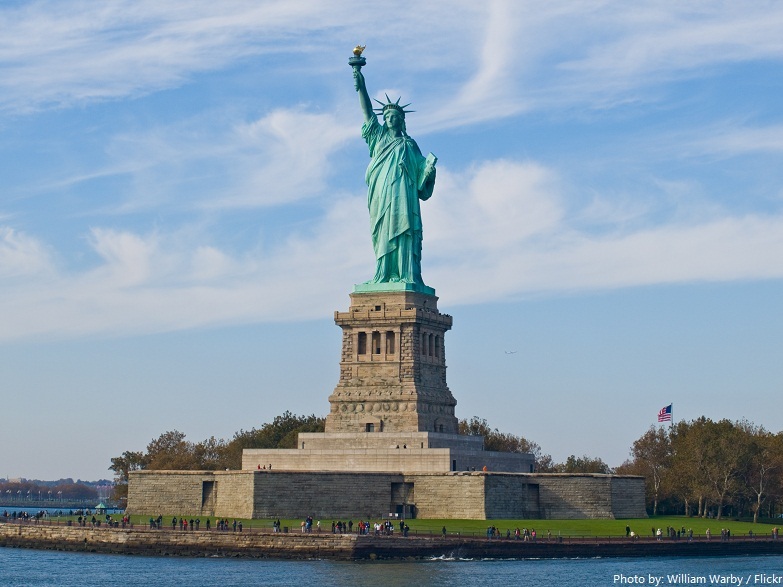 In 1984, the Statue of Liberty was designated a UNESCO World Heritage Site. The Statue of Liberty was once the tallest man-made structure in New York City (and the United States), surpassing the towers of the Brooklyn Bridge and the steeple of Trinity Church in Lower Manhattan. The French ship “Isere” transported the Statue of Liberty’s 300 copper pieces packed in 214 crates to America.Although the ship nearly sank in rough seas, it arrived in New York on June 17, 1885. 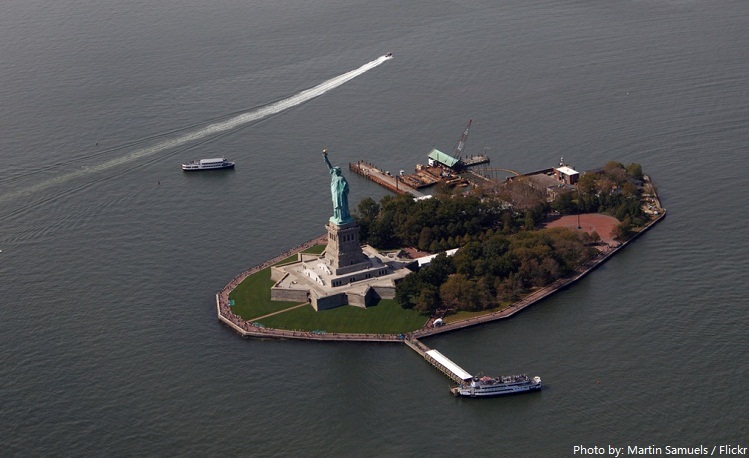 The island in which it stands was previously called Bedloe Island, but its name was changed in 1956 to Liberty Island. 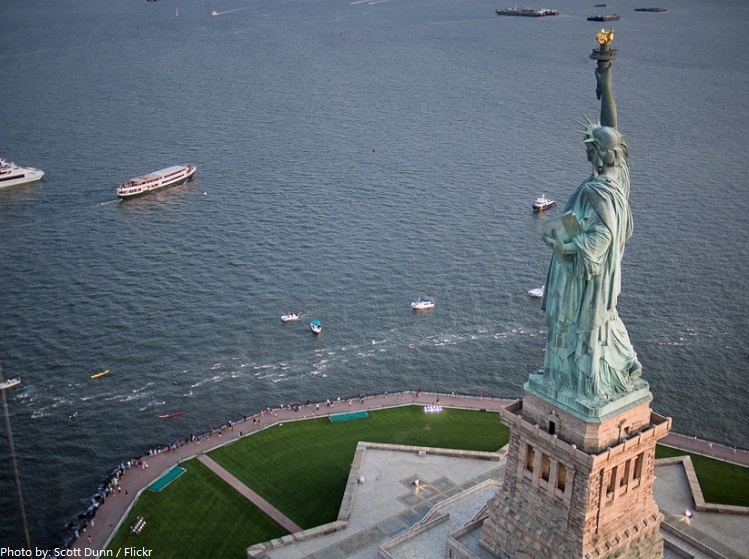 Private boats are not allowed to dock at Liberty and Ellis islands. Therefore the only way on is via the ferry system. 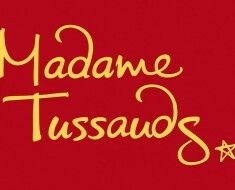 Approximately 4 million people visit the statue each year. The cost of building the Statue of Liberty and pedestal amounted to over $500,000, over $10 million in today’s money. 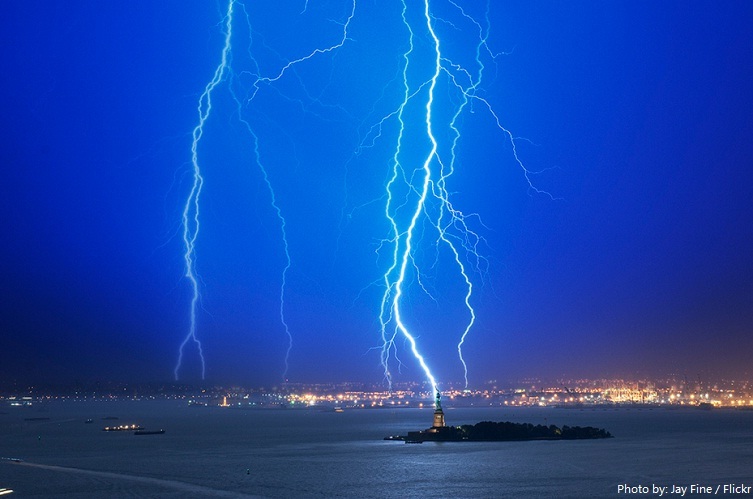 The Statue of Liberty is thought to be hit by up to 600 bolts of lightning every year. The statue functioned as a lighthouse from 1886 to 1902, lighting a distance of up to 39 kilometers (24 miles) away. In 1944 the lights in the crown flashed “dot-dot-dot-dash” which in the Morse code means V, for Victory in Europe. During its restoration in 1982, it was discovered that the Statue of Liberty’s head had been installed 0.6 meters (2 feet) off-center. Andy Warhol painted “Statue of Liberty” as part of his Pop Art series in the 1960s.It is estimated to be worth in excess of $35 million. The Statue of Liberty appears in many movies incuding: Planet of the Apes, Splash, Superman IV, Ghostbusters II, Titanic, Deep Impact, X-Men, The Day After Tomorrow and Cloverfield. Two images of the statue appear on a $10 bill. The Statue of Liberty has been depicted on several coins, not only in the USA, but all over the world. 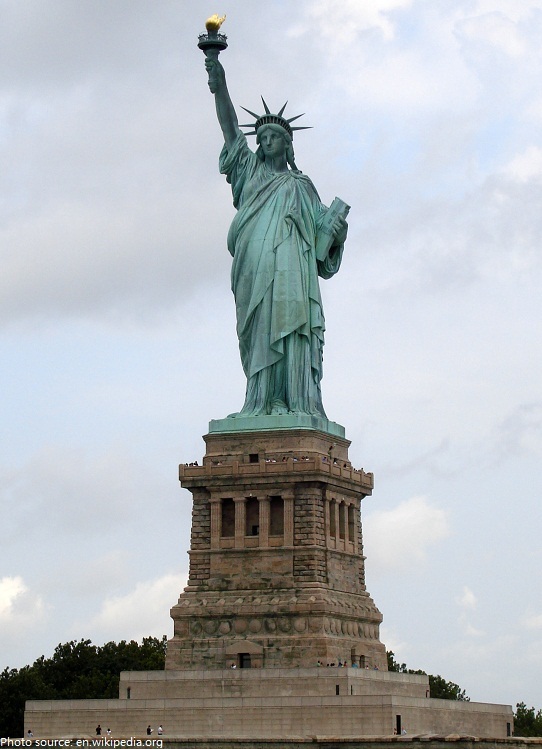 Hundreds of replicas of the Statue of Liberty are displayed worldwide.A smaller version of the statue, one-fourth the height of the original, was given by the American community in Paris to that city. 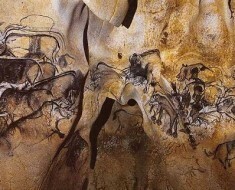 Comment Text* This is an incredibly informative site. A resource centre par excellence!